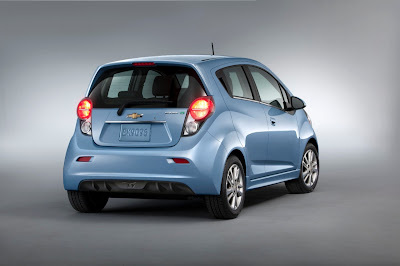 The 2014 Chevrolet Spark EV, introduced today ahead of the Los Angeles International Auto Show, packs smart performance and connectivity technologies into an affordable five-door urban mini car designed to make the trip as electrifying as the destination. It will be priced under $25,000 with tax incentives. 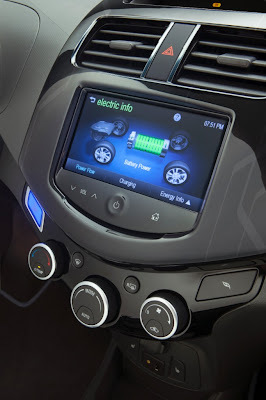 With the Chevrolet Volt, Chevrolet accounts for more than 50 percent of all plug-in electric vehicle sales in the United States and Spark EV builds on Chevrolet’s proven electric motor and battery development programs. When it goes on sale next summer, the Spark EV is expected to have among the best EV battery range in its segment and be the first electric vehicle to offer SAE Combo DC Fast Charging capability, enabling the Spark EV to reach 80-percent battery charge in just 20 minutes. Inside the Spark EV, critical vehicle functions are clearly and intuitively displayed on one of the vehicle’s two reconfigurable, high-resolution, seven-inch color LCD screens, including a confidence gauge that shows the expected driving range based on driving habits and other conditions. 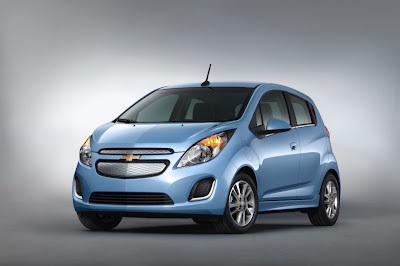 Spark EV also will keep urban drivers musically connected with Chevrolet’s exclusive MyLink radio that comes standard and safely brings smartphone-based infotainment – including apps for BringGo full-function navigation, TuneIn global internet radio, Pandora and Stitcher – into the vehicle. Apple’s Siri will ride shotgun, for customers with compatible (4S and newer) iPhones. In addition to previously announced markets including California and South Korea, Spark EV will also go on sale in participating dealerships throughout Oregon, Canada and other global markets. Spark EV will be eligible for coveted high-occupancy vehicle (HOV) lanes in California. 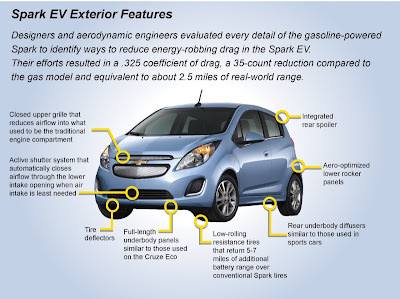 Spark EV is powered by an advanced electric motor and battery system. It consists of a GM-designed, coaxial drive unit and electric motor that together deliver 130 hp (110 kW) and 400 lb.-ft. (542 Nm) of torque for instant acceleration; and a more than 20-kWh lithium ion battery is expected to provide among the best EV range performance in its segment. The drive unit and motor will be assembled of U.S. and globally sourced parts at GM’s White Marsh, Md., manufacturing facility, and the first time a U.S. automaker has built both a complete electric motor and drive unit for a modern electric vehicle in the United States. Spark EV’s long-life battery is designed to be safe, durable and reliable, and is warranted for eight years or 100,000 miles. It consists of a 560-pound (254 kg) square lithium-ion battery pack with a volume of 133 liters, comprising 336 prismatic cells. Spark EV is the first all-electric vehicle in North America to offer optional SAE Combo DC Fast Charge capability, which can charge the battery to 80 percent of capacity in about 20 minutes. A common on-board charging receptacle accommodates all three charging platforms – DC Fast Charge, AC 240V and AC 120V. Using a dedicated 240V outlet, Spark EV recharges in less than seven hours. Owners can coordinate charging according to departure time or during off-peak electricity rates. They also can manage and monitor the vehicle remotely via computer at OnStar.com, or with a special Chevrolet Mobile App powered by OnStar Remote Link. The Spark EV comes with three years of standard OnStar service. In developing the Spark EV, Chevrolet set out to help customers conserve as much total energy as possible to maximize battery range. One important way to achieve that is by improving the vehicle’s aerodynamics. 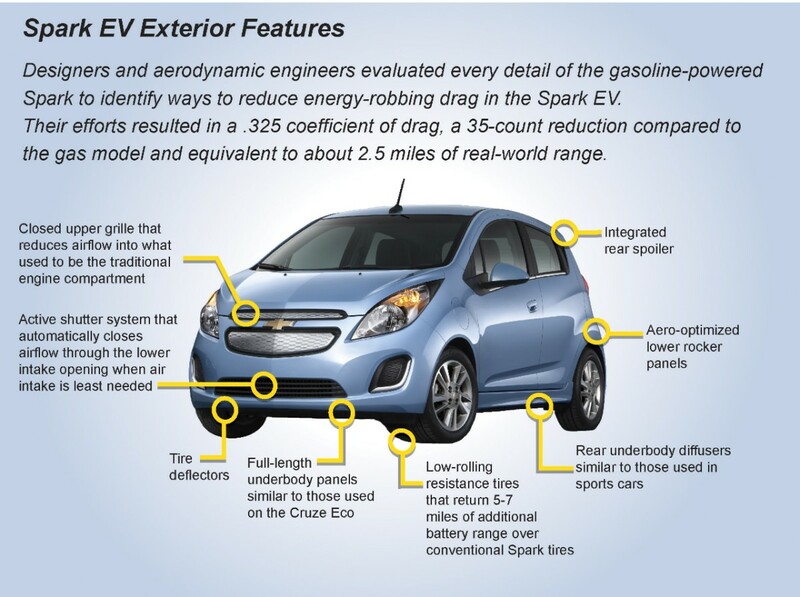 By evaluating every detail of the gasoline-powered Spark, designers and aerodynamic engineers added the equivalent of about 2.5 miles of real-world range. Spark EV colors include Electric Blue, Black Granite, Summit White, Silver Ice and Titanium. Inside, designers sought to create a comfortable and spacious cockpit with noise-reduction features and a combination of bright accents in Electric Blue and chrome.